Stitches: ch, sc, sc2tog, sl st, hdc. R1: Ch 24, join with sl st in first ch to form a ring. Ch1, do not turn. Sc in ea ch around. Rs2-5: Working in a continuous round placing markers as needed. Sc in ea sc. R6: Sc2tog. Sc in ea of next 10 sts. Sc2tog. Sc in ea of next 10 sts. R7: Sc2tog. Sc in ea of next 9sts. Sc2tog. Sc in ea of next 9sts. R8: Sc2tog. Sc in ea of next 8sts. Sc2tog. Sc in ea of next 8sts. R9: Sc2tog. Sc in ea of next 7 sts. Sc2tog. Sc in ea of next 7 sts. R10: Sc2tog. Sc in ea of next 6 sts. Sc2tog. Sc in ea of next 6 sts. R11: Sc2tog. Sc in ea of next 5 sts. Sc2tog. Sc in ea of next 5 sts. R12: Sc2tog. Sc in ea of next 4 sts. Sc2tog. Sc in ea of next 4 sts. R13: Sc2tog. Sc in ea of next 3 sts. Sc2tog. Sc in ea of next 3 sts. R14: Sc2tog 4 times. Join with sl st.
R1: Ch20, sc in 2nd ch from hook. Hdc in 7 sts. Sc in 3 sts. Hdc in 7 sts. Sc in last st. Working in unworked lps on opposite side, work 2 more sc in the last st. Hdc in 7 sts. Sc in 3 sts. Hdc in 7 sts. 2sc in the last st. Join with sl st.
Use yarn needle and same yarn to sew ears on top of the front of the head. R1: Ch3, sc in 2nd ch from hook. Sc in last ch. R5: Ch5, sc in 2nd ch from hook. Hdc in next 3 sts. Sc in ea sc on R4. Rs6-7: Ch1, turn. Sc in next 2 sc. (Rep Rs 5-7, sc in next 2sc on last row.) twice. 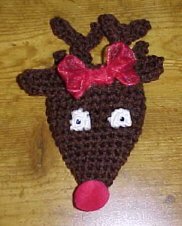 FINISHING: Sew antlers using same yarn to the back side of the head. Sew the bow made using the ribbon to the front of the head. Using a D hook, ch3, 2hdc in 3rd ch. Fasten off leaving a yarn tail to use when sewing them on. Sew eyes on using a yarn needle and then glue the wiggle eyes to them.